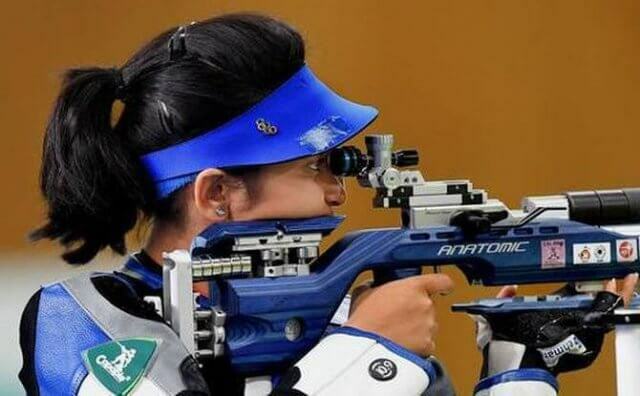 Mehuli Ghosh shot down two more gold medals to continue her golden run at the 62nd National Shooting Championship in Thiruvananthapuram, Kerala. Mehuli, who turned 18 today, won the junior and youth mixed team titles to go with her women’s junior and youth individual and team gold medals earlier. Mehuli partnered with 10-year-old Abhinav Shaw, both in the junior and youth mixed team events, to strike gold with scores of 498.2 and 498.8 respectively. 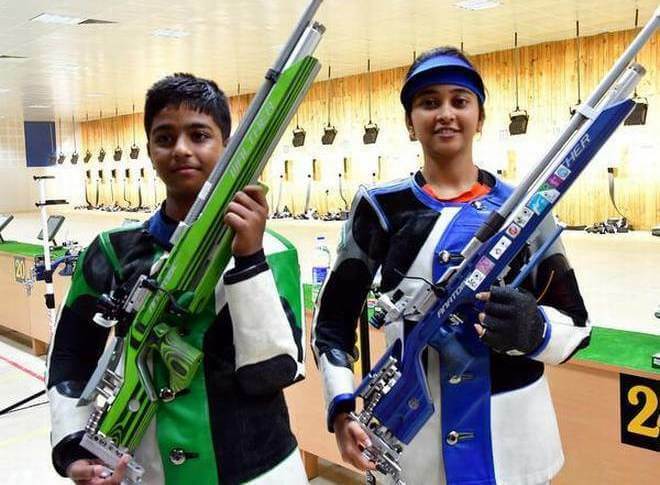 From left: Abhinav Shaw & Mehuli Ghosh after winning Gold in the Junior and Youth Mixed 10m Air Rifle. The junior silver was won by the pair of C. Kavi Rakshna and Rithik Ramesh of Tamil Nadu with 493.7 while the bronze was won by the pair of Divyansh Singh Panwar and Manini Kaushik of Rajasthan with 429.5. In the youth mixed event, Aishwarya Pratap Singh and Yana Rathore of Madhya Pradesh won the silver with 497.3 while the Rajasthan duo of Manini and Divyansh bagged another bronze with 436.0. Anjum Moudgil won her third gold in the competition, partnering Arjun Babuta to help Punjab win the senior mixed team event with 497.3. The silver was bagged by Rajasthan pair of Divyansh Singh Panwar and Barkha Chauhan with a score of 496.6, while Kajal Saini and Sahil of Haryana won the bronze with 427.1. Mixed 10m Air Rifle: 1. Punjab (497.3) 828.9; 2. Rajasthan (496.6) 829.2; 3. Haryana 427.1 (828.8). Junior Mixed 10m Air Rifle: 1. West Bengal (498.2) 829.7; 2. Tamil Nadu (493.7) 828.3; 3. Rajasthan (429.5) 826.4. Youth Mixed 10m Air Rifle: 1. West Bengal (498.2) 829.6; 2. Madhya Pradesh (497.3) 830.1; 3. Rajasthan (436.0) 831.3.